In March 2006 I gave a talk to the Friends of Pennypack Park, a very active group that cares intensely about the well-being of the creek and the surrounding 1,600 acres of Philadelphia parkland. From the tone of the well-attended meeting that preceded my presentation, its collective membership seems to know everything that goes on in the Park every minute of the day or night. The Park was created beginning in 1905, and protects one of the few watersheds in Philadelphia that was not either obliterated (after the burying of the streams) or badly encroached upon. With miles of bike, hiking and horse trails, the Pennypack is one of the gems of the Philadelphia park system. After my talk, FOPP member Roland Williams gave me permission to post his map of the park on Philly H2O. This incredibly detailed map reflects Roland's lifelong love of the area, and I hope he doesn't take offense at the liberty I have taken by coloring the creek and its tributaries in blue. The day after my talk I visited Theresa Stuhlman and Rob Armstrong at the Fairmount Park Commission Archives, and they gave me permission to scan and post the 1916 Report on Pennypack Park, with its beautifully rendered plan and informative text. The other plans come from my research into the Pennypack for PWD. LEFT: Pennypack Park, as drawn by Roland Williams in 2005. The detail of this map is remarkable, and its effort to include even the smallest tributaries to the creek is laudable. This map reflects a deep love of the natural world that I wish more city dwellers would share. 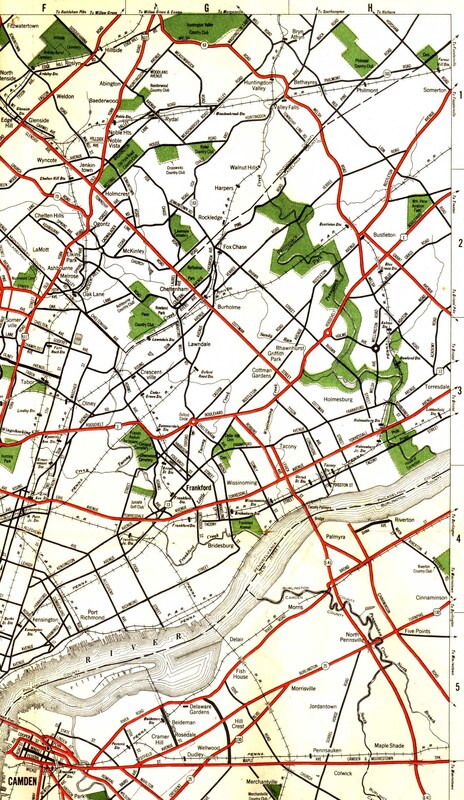 RIGHT: Pennypack Park, including Sandy Run, from a 1930 road map of Philadelphia and vicinity. Also shown is the Frankford Creek and part of its tributary, Wingohocking Creek. 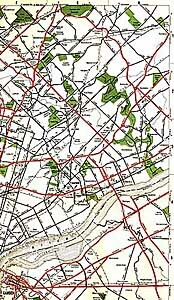 Unfortunately, the Wingohocking (with two branches and 21 miles of streams) had been wiped off the map by 1928, after more than 40 years of sewer-building in its bed. Sometimes mapmakers couldn't keep up with sewer-builders!